The Intel® Xeon® E based TS-2483XU-RP enterprise NAS with up to 64 GB DDR4 ECC (Error Correcting Code) memory delivers server-grade performance with dependable reliability. It features Mellanox® ConnectX®-4 Lx 10GbE controllers that not only fulfill bandwidth-demanding applications but also support iSER to offload CPU workloads with boosted virtualization performance, while PCIe expansion allows for installing graphics cards to empower video surveillance, virtualization and AI applications. The performance-driven TS-2483XU-RP provides you with advanced business-ready features, including software-defined SSD extra over-provisioning, software-defined networking & virtual switch, and much more. DDR4 ECC memory detects and then corrects single-bit memory errors, demonstrating high reliability for crucial applications. Two 10GbE SFP+ SmartNIC ports with iSER support accelerate large file sharing, intensive data transfer, and VMware virtualization applications. PCIe expandability allows for graphics cards or 40GbE/ 25GbE/ 10GbE adapters to increase application performance. Supports VMware®, Citrix®, Microsoft® Hyper-V® and Windows Server® 2016 virtualization with reliability and cost-efficiency. Software-defined SSD extra over-provisioning combats write amplification and optimizes SSD random write speeds for IOPS-demanding applications. Comprehensive security management, providing a security portal for your NAS and helping you to stay informed of NAS status at all times. Note: 1U, 2U rackmount models use low-profile graphics cards; 3U, 4U rackmount models use high-profile graphics cards. 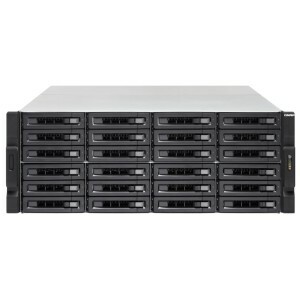 Designed for connecting the TS-2483XU-RP to REXP expansion units to increase storage capacity by adding up to 128 SAS/SATA drives. Enable lightning-fast throughput for bandwidth-demanding tasks such as virtualization, massive data transmission, and fast backup/restoration. Add M.2 SSD caching or 10GbE (10GBASE-T) connectivity to the NAS for optimized performance and bandwidth. 1. 3U/4U models support high-profile graphics cards that require external power; 1U/2U models support low-profile graphics cards that do not require additional external power (For example, the NVIDIA GT1030). 2. GPU support for QTS only applies to NVIDIA graphics cards. GPU Passthrough for VM is supported by AMD and NVIDIA graphics cards. 3. When Virtualization Station uses graphics cards, the NAS will temporarily stop hardware transcoding acceleration for QTS (and vice versa). 4. Always consult the Compatibility List for supported NAS and graphics cards before purchasing a graphics card for the NAS. SSD caches accelerate IOPS performance and reduce latency for storage volumes. They are perfect for IOPS-demanding applications (including databases and virtualization) and can significantly improve overall workflows. The TS-2483XU-RP also supports write-only SSD caches to greatly boost write-intensive applications and also RAID 5/6 SSD caches for higher performance and caching space. Qtier™ Technology empowers the TS-2483XU-RP with auto tiering that helps continuously optimize storage efficiency by automatically moving data between 2.5-inch SSDs and high-capacity HDDs based on the data's access frequency. Qtier™ 2.0 features IO-awareness that empowers SSD-tiered storage with a cache-like reserved space to handle burst I/O in real time, greatly maximizing the advantages of SSDs. Snapshots are essential for NAS data protection, and their block-level feature makes them a dependable method for protecting data in the face of the growing threat of ransomware. The TS-2483XU-RP supports up to 256 snapshots per volume/LUN, and up to 1,024 snapshots per NAS. With high performance, potentially huge storage capacities, integrated virtualization solutions, and support for snapshots that record the state of the system at any time, the TS-2483XU-RP is perfect for backing up virtual machines. Use the license-free QNAP NetBak Replicator utility to back up/restore files from Windows® computers. Time Machine® is fully supported for backing up Mac® computers. Checks for NAS weaknesses and offers recommendations to secure your data against multiple attack methods. It also integrates anti-virus and anti-malware solutions to assist you in protecting your NAS. QNAP provides several ways to expand your NAS storage as needed to accommodate data and business growth. Connect up to eight REXP-1620U-RP, REXP-1220U-RP, or other expansion enclosures. *A SAS storage expansion card is required. Use VJBOD (Virtual JBOD) to expand your storage capacity by using the unused storage of other QNAP NAS. Up to 8 QNAP NAS can be mounted as local disks on the TS-2483XU-RP. A full-text search engine that helps quickly find specific images, music, videos, documents, and emails by using keywords and search conditions. Enable remote access through NAS browsers to access local LAN resources without requiring complex VPN settings.